Take a Tampa charter bus to ZooTampa for your next school field trip, birthday party, or even corporate holiday party! National Charter Bus is your premier group transportation service for any occasion being held at ZooTampa at Lowry Park. Travel to one of Tampa’s most popular destinations in a modern charter bus rental with a professional driver behind the wheel. 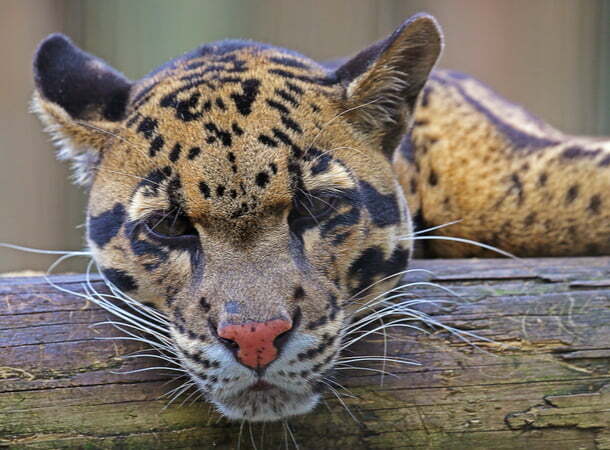 Call us at 813-328-8085 to receive a personalized quote for your zoo trip. 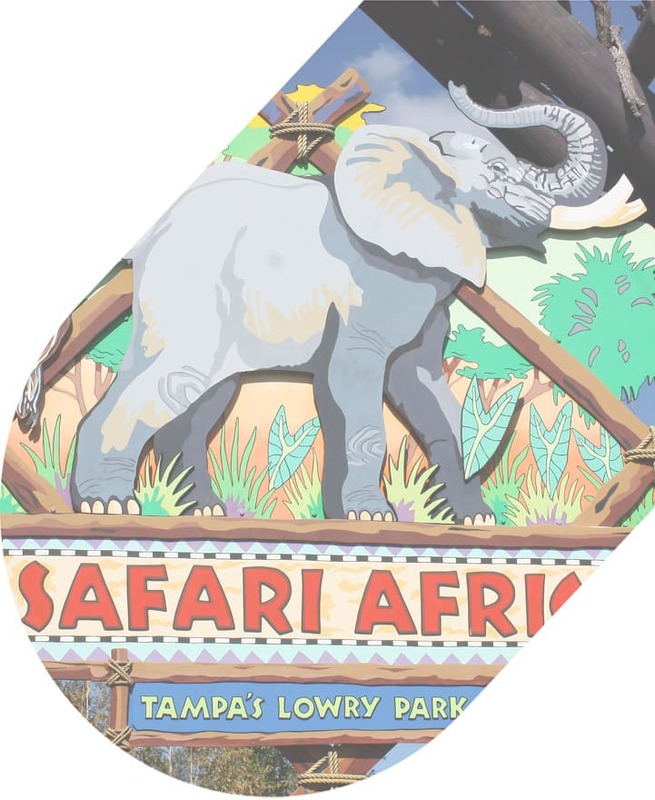 Located in Tampa’s quaint Lowry Park neighborhood along the Hillsborough River, ZooTampa is a popular destination welcoming around one million visitors every year. Locals and tourists flock to ZooTampa to enjoy and learn from its 1,300 furry, scaly, and exotic residents. The zoo is home to exhibits featuring Florida’s native wildlife like panthers and manatees alongside international wildlife like pygmy hippos and African elephants. It is also home to the David A. Straz, Jr. Critical Care Center, Florida’s only critical care center specializing in the rehabilitation and care of the beloved Florida manatee. ZooTampa is hailed for being one of the most family-friendly zoos in the region, offering a successful mixture of entertainment and conservation education. 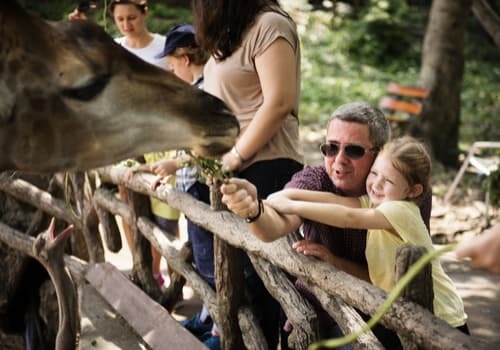 Guests can participate in giraffe and rhino feedings, backstage animal encounters, and educational programs designed for children of all ages. The zoo also offers a handful of rides like Roaring Springs, a family-friendly water experience and a perfect way to beat the Florida heat. ZooTampa is a great location for animal lovers of all ages, but elementary-aged children will especially enjoy the 63-acre park. School groups of older adrenaline-seeking teens may want to opt for Busch Gardens, while The Florida Aquarium is another option for kids more interested in aquatic life. ZooTampa offers year-round educational field trip options for youngsters wanting to learn about the wide range of animals in its care. When you plan a field trip to ZooTampa, booking a private charter bus with National Charter Bus Tampa is the way to go! Old school buses without efficient climate control features are the last thing students want to see on a hot Florida day. Choosing a modern charter bus in Tampa is a much better alternative. With reclining seats, air-conditioned cabins, and entertainment systems, a charter bus is the transportation students deserve. All field trips at ZooTampa are self-guided but do include educational materials and a fun scavenger hunt guide. Groups of pre-k and kindergarten students require at least 1 chaperone per 5 students. Older students in first grade and up require 1 chaperone per 10 students. Pre-ordered lunches are available (drinks are not included) and must be ordered at least 5 days prior to the field trip. Each student should bring clothes that can get wet in the zoo’s splash zone, plenty of sunscreen, and reusable water bottles. Cost: around $25 a student, while each required chaperone is free. Additional chaperones must pay admission. ZooTampa isn’t just for field trips. It’s also a wonderful location for special events like weddings, birthday parties, and business events such as holiday parties or picnics. The zoo offers four separate venues that can serve as space for events of all types. Plan your intimate wedding service at the Ituri Forest Patio or Reilly’s Reserve, a kid’s birthday bash at Wallaroo Station, or a company banquet at Savanna Marketplace. These venues range in capacity, accommodating anywhere from 175 to 750 guests. Enjoy a unique event with views of giraffes, elephants, hippos, and various other beautiful animals. Booking private charter bus transportation for your event at ZooTampa will help keep everything running smoothly. With National Charter Bus, your event guests will have a shuttle to transport them to the zoo in a timely fashion. Reserve a minibus for your relatively small event or a full-sized charter bus for your large group. If you’re not sure the best type of bus for your event or you need to build a custom fleet, our rental experts will be happy to help. National Charter Bus Tampa has organized group transportation services across the region. You’ll have the utmost professional care to keep your ZooTampa event going according to schedule. Along with field trips and private events, ZooTampa hosts its own array of popular annual events. Guests with zoo memberships can take advantage of exclusive events like Zoo University, a monthly educational series led by experts. This beloved holiday event brings a wealth of cheer and winter fun to the Tampa Bay area. 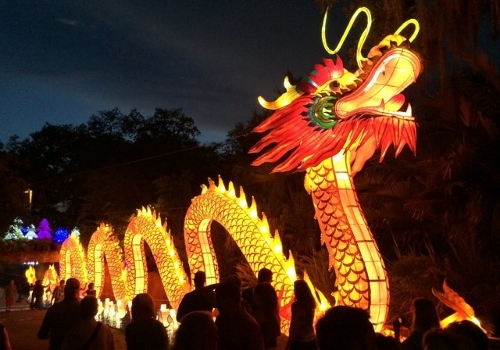 Thousands of lights adorn ZooTampa along with nighttime animal encounters, seasonal treats, and more. ZooTampa takes a scary turn every Halloween season with this special family-friendly spooktacular. Explore the zoo after dark with Halloween-themed activities, costumes, and plenty of (not too scary) fun. Yoga enthusiasts of all experience levels are encouraged to attend ZooTampa’s unique series of yoga classes. Tickets to a morning yoga class also include general admission to the rest of the zoo. Pre-booked tickets: $24.95 for children ages 3-11, $33.95 ages 12+, children under 3 are free. Parking and admission for bus drivers is free. Groups of 15 or more can take advantage of group discounts when pre-registering with the zoo. Tampa locals or tourists with plenty of time should look into buying a Tampa CityPASS. This ticket also grants admission to Busch Gardens, the Florida Aquarium, and more. Don’t forget about ZooTampa’s additional animal encounters. These tours require pre-registration and are an additional $25 on top of general admission. The best time to visit ZooTampa is usually during the fall and winter months when Florida weather is cooler and more forgiving. Most visitors spend upwards of 4 hours at ZooTampa, be sure to dress comfortably! Outside food and beverages are not permitted in the zoo but you may bring up to 20oz of water in a sealed container. National Charter Bus not only services trips to ZooTampa, but to occasions around the entire Tampa Bay area. Whether you’re traveling with your school to the zoo, shuttling a business group to the Tampa Convention Center or having a bachelor party in Ybor City, we have a transportation solution for you. When you book a charter bus with us, you’ll have access to a large fleet of buses equipped with all the comforts you need. Relax in reclining seats, enjoy a movie with televisions equipped with DVD players, or stay connected with WiFi and power outlets. Your Tampa Bay travels will be taken care of from beginning to end. Groups of locals and tourists can count on National Charter Bus for any type of group transportation. Whenever you’re ready to book your charter bus to ZooTampa or another Tampa Bay location, call us at 813-328-8085. Our team of experienced and friendly reservation experts is here 24/7 to help you find the best charter bus in Tampa.